The Hyundai Veloster available at Bill Dodge Hyundai is a compact car. The body design features two doors and a rear hatchback. This vehicle is offered in a number of trim levels that each have a different engine. The Veloster is a small car that delivers a powerful performance with good fuel efficiency. The base model of the Hyundai Veloster features a 2.0 liter four-cylinder. This engine provides 147 horsepower. There is also a Veloster Turbo whose engine produces up to 201 horsepower. 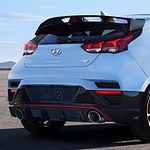 The Veloster N features a 2.0 liter four-cylinder that provides a very impressive 275 horsepower. Even with the larger, turbo-charged engines, the Hyundai Veloster provides fuel-efficiency. The Veloster can obtain up to 34 mpg in highway driving. This mileage is obtained with the automatic transmission. There is also an optional standard transmission available as well. The turbo-charged versions of the Veloster has the option of a dual-clutch transmission.